An Alpine man and his girlfriend, who are charged in the death of the woman’s 18-month-old daughter, pleaded not guilty to multiple felony counts Thursday. Wiliey Foster, 26, was arrested Friday and charged with murder and child abuse causing death. He is being held in lieu of $2 million bail. The 18-month-old victim, Leah Brown-Meza, who died from blunt force trauma, according to the San Diego County Medical Examiner’s Office. The child’s 21-year-old mother, Lillie Golden Brown, was taken into custody three days later and is charged with three counts of felony child endangerment. Deputy District Attorney Chantal de Mauregne told Judge Daniel Goldstein that the toddler suffered from multiple head injuries, a broken arm and burns to the bottom of her feet — inflicted within a 4 1/2-day period — and was never taken to a hospital. “(The defendants) discussed it and never did anything,” de Mauregne alleged. “This is a tragic situation for all parties involved,” she said outside the courtroom. The defense attorney said other people had access to the girl during the short period of time she was with the defendants, and a third party could have inflicted her injuries. Both defendants are cooperating with investigators, she said, adding that her client has a 5-month-old child who shows no signs of injuries. De Mauregne said she had no record of the toddler being injured in the past. Sheriff’s deputies and paramedics responding to a report that a child had stopped breathing in a motor home parked on a residential property in the 300 block of Hunter Lane found the girl’s body shortly after noon on Dec. 6. 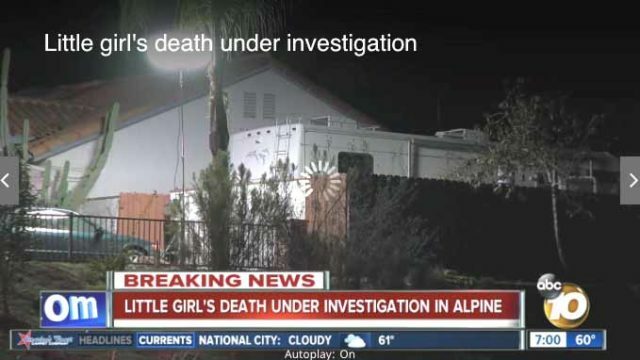 Homicide and child-abuse detectives were then called in to investigate the child’s death “based on the circumstances and the presence of additional injuries to the victim,” sheriff’s Lt. Kenneth Nelson said. Foster faces 25 years to life in prison if convicted. Brown, whose bail was set at $300,000, faces up to 10 years. The judge set a preliminary hearing for March 22.